Handloom sarees require handling with a lot of attention and care as they are extremely delicate. always preferable to give it to dry cleaners for a wash. But if you cannot have your saree dry cleaned, then you must take matters into your own hands. 1) Saree Cleaning…Before washing your sarees with soap, keep them soaked in salt water for some time.Do not use a brush, even for stains, as it can easily tear the fabric.Always use cold water. Remember, handloom sarees are very delicate so NEVER use hot water . 2) Stain removing….Wet the stain areas with water and apply a thick coat of white toothpaste over the stains on both sides of the fabric. Hang the saree to dry for 3-4 days. Now wash off the toothpaste. If the stain is completely gone.f it’s an oily stain, say from food, sprinkle talcum powder on it and wait till it soaks in the oiliness. Then rub it gently and wash it off.For tougher stains, it is advisable to take it to a dry cleaner. * soak the saree in dove shampoo in cold water for 30 minutes.Then rinse, dry and steam iron the saree to remove all traces of starch. * 4) Dry a handloom saree after wash:..always Avoid direct sunlight when drying a saree Dry it in partial shade.to avoid fabric discoloration. * dry the saree by wrapping it in a large, towel. You may need to fold the saree to fit it along the length of the towel. Gently roll and press the towel to remove excess water from the saree. Remove the saree from the towel and hang it to dry completely. 5) How to iron a handloom saree:…always do steam iron the saree and keeping the iron in medium to low heat. Always keep the garment on an ironing board or a cotton cloth before pressing to avoid creases. 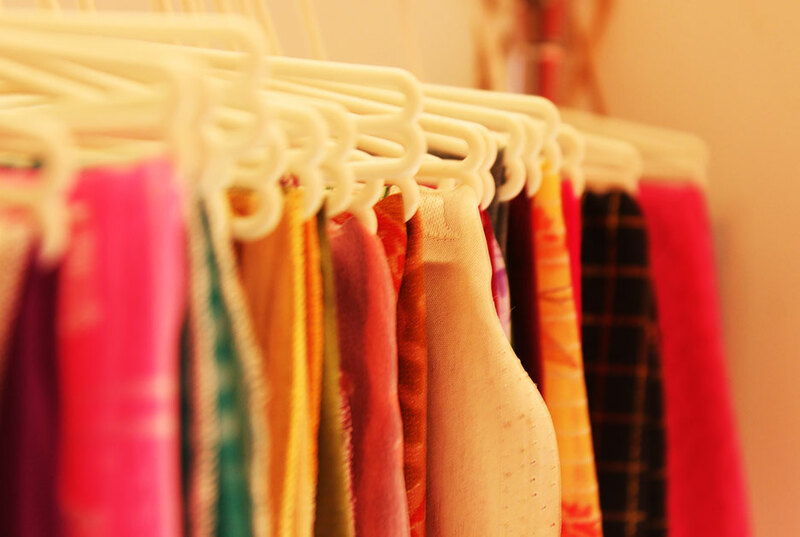 : 6) How to store handloom sarees …Store the saree in a light cotton muslin cloth. This will give the saree breathing space and will prevent one saree from sticking to another when kept in a pile. [ store your saree when it is absolutely dry before storage as moisture can damage the fabric.